I couldn't find much information about this in the offseason, but I secretly wished for a new CF camera angle. Santa was involved. 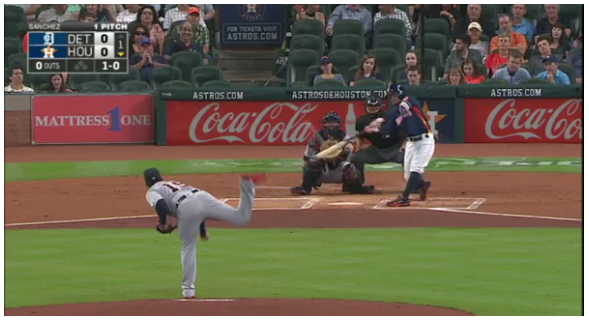 Previously, the camera angle was off to the 3B side of the plate by a fair way, and I thought it made strikes hard to see, and the quality of contact from the batter difficult to ascertain. I think Jason Grilli may be the pitcher, and Evan Gattis Jose Altuve the batter. But, yeah, gives a good account of where the CF camera used to be - well off the the side, and well, kind of low. Here is a still, lifted from FanGraphs, showing a Jose Altuve home run at MMP. This makes the point nicely about the CF camera angle. It isn't quite as bad as the Rogers Center, but it is still low and toward the 3B side of the pitching mound. If you ever want to watch a lefty paint the corners (looking at you, Dallas Keuchel!!) then this is a great angle to have. The camera position looks a little more elevated, and slightly toward the 1B side of the mound. The head of some pitchers will obscure the plate at the set, but the plate is clearly seen during the pitch. Some CF camera angles can be too high so as to make it hard to see low balls and strikes, but this one isn't. My impression was that it was easier to see whether a pitch was a ball or a strike, and whether contact was hard or soft; or fair or foul. Overall, I thought the angle was far superior to the last one, so all my Christmas wishes have been fulfilled, now. I liked the angle a lot, and agree that Blum and Kalas make a good duo. I haven't been this excited for a season to start, since ever. Bill Brown was sooooo smooth, however. I remember him making a joke about something, and even my wife - who ain't no baseball fan - laughed. Kalas seems ok, but Bill Brown is some large shoes to fill. Am I correct in assuming that the fist screenshot is not from MMP? But either way, I do like that more centered angle. Sure gonna miss that deep from the stomach Bill Brown laugh. I have had a habit for many years of loudly copying his laugh right after he throws one down. Wife thinks I'm a nut. That being said, Blum and Kalas might make a fine team. They complimented each others strengths well. I really like the new camera angle. I made mention of it in the TCB game thread.